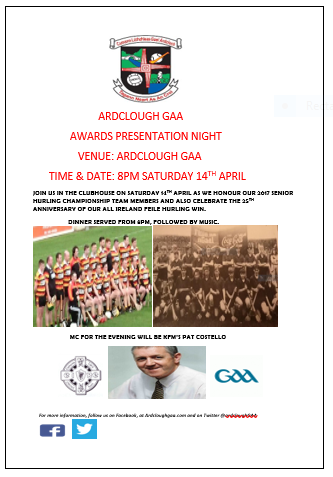 A quick reminder to all that our rescheduled awards presentation night will take place this coming Saturday, April 14th in the Ardclough Clubhouse at 8pm. MC for the night will be KFM’s Pat Costello. We look forward to seeing you for an evening of craic agus ceol as we honour our 2017 Senior Hurling Championship winning team and celebrate the 25th Anniversary of our All Ireland Feile Hurling victory. See you there!